A tour of advanced physical concepts demonstrates that time travel, once the domain of sci-fi, has moved into the purview of science. Toomey (Nonfiction Writing/UMass Amherst; Stormchasers, 2002, etc.) gives a nod to novelists for hatching the idea of time travel, then turns to scientists. Einstein’s relativity theory states that rapid travel or strong gravitational fields slow the passage of time for those who experience them. This makes time travel to the distant future possible, if not quite satisfactory, since it’s a one-way trip. Other corollaries of relativity hold out more intriguing possibilities. Dutch physicist Willem Jacob van Stockum describes a time-travel device involving a rotating cylinder of infinite length that would allow travel into the past. But while his math is unassailable, no infinite cylinder can exist in the universe we know; the device is “unphysical.” Other physicists have tried to find more plausible engines to drive their time machines. For his novel Contact, Carl Sagan asked Caltech’s Kip Thorne for a workable time-travel theory; Thorne suggested a wormhole, a shortcut through space implied in general relativity. 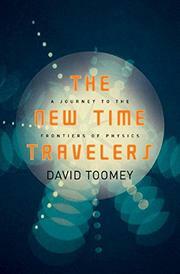 Toomey goes on to examine time-travel explorations by other respected physicists, among them Stephen Hawking. The book touches on such esoteric ideas as the “many worlds” interpretation of quantum theory, and the anthropic principle. One particularly strong chapter considers the apparent absence of time travelers in the present day; another examines a critical theoretical limitation: No theory exists by which a traveler can reach a point in time earlier than the activation of his machine. Toomey reasons that if a highly advanced alien race invented a time machine, say, half a million years ago, we only need to make contact with them and then use their machine to visit our own early history. Good overview of many challenging ideas.